Anyone who comes to the Kirnitzschtal is often reminded of a landscape from "Lord of the Rings". You do not need to tell much, because this nature does not need words, you have to see and experience them. 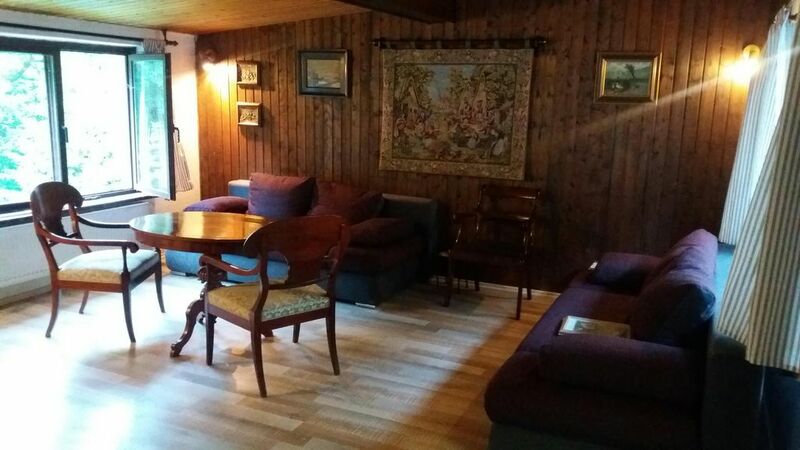 Our romantically furnished holiday homes are located in absolutely idyllic nature, in the middle of the Saxon Switzerland National Park, on the banks of the river Kirnitzsch. From here you can easily walk all walks or take the bus or the Kirnitzschtalbahn, whose stops (bus line 241) are not far away (bus stop "Botanischer Garten"), which bring you to your hiking destination or to the train station. This holiday home has a large living room and bedroom with flat screen TV, 2 sofa beds for 1 to 2 persons (4 persons in total) with open large dining area and a kitchen with ceramic hob, fridge, coffee maker, el. Kettle, toaster, cooking and utensils. The bathroom is with shower / WC. The cottage has a separate entrance. Behind the house you will find lawns and secluded spots for sunbathing or for cozy evenings. The riverside terrace is accessed via the stairs on the hillside next door. There you can make a fire in a fire bowl or barbecue (please bring your own barbecue). The Kirnitzsch is ideal for Kneipp baths or for cooling off on hot days (best bring swimming shoes). Der Bungalow liegt leider etwas sehr nah an der Straße (auch wenn da nicht viel Verkehr ist) und es gibt keinen Backofen sondern nur einen Toaster aber ansonsten für den Preis und die Lage sehr gut, das Bad ist sehr hübsch.